Sailing in Greece with TZENNET yachting is the best economy and quality choice for holidays in Greece. TZENNET yachting is a well known Greek yacht charter and tourism agency which was established by Takis (Panagiotis) Tzennetoglou and is successfully involved in the yacht charter business since 1988. Our main office is located in Athens and we have bases in several islands in the Aegean and the Ionian Sea. Our experience and love for the sea, the boats and sailing and our care and respect about our clients' needs and pleasure make our company prominent and most reliable with satisfied repeated clients. 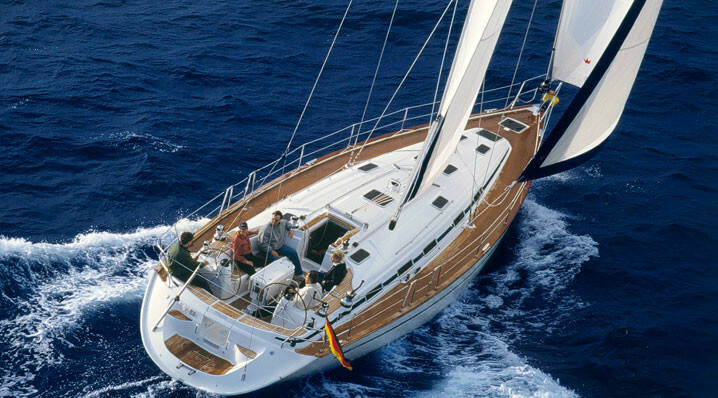 Our chartering organization offers you several select yachts of a size range from 30 up to 78 feet, which all are built by the most famous and reliable European builders (Jeanneau yachts, Beneteau yachts, Bavaria yachts, Hanse yachts). Every single boat of our fleet is in excellent condition and very well equipped, in order to satisfy our high standards of function and safety and to ensure your safe and comfortable cruise. The standard inventory list goes for all the yachts although most of them are much better equipped. In case you don't have enough experience in sailing or any experience at all, we can offer you sailing yachts with skipper. Our skippers are very experienced in all kinds of weather and know very well the Greek islands. They are pleasant persons and very good guides and they will do their best, in order to enjoy a safe cruise. For those who don't have company for chartering a yacht we have organised berth charter programs that give you the opportunity to enjoy a sailing cruise even if you are alone. So, you can choose the suitable berth charter program and join a sailing cruise in the Greek islands. We strongly believe that our job is the pleasant and trouble-free holidays of our clients. For this purpose we offer you a personal service from the time you arrive in Greece till the end of your holidays, being alert to support and assist you with our qualified staff, even in the very remote islands, in case you need our assistance. Moreover we can give you information and help you out with hotel reservations and transportation tickets in case you need it. In our web site you will get a little taste of Greece and mostly some ideas about organizing your holidays, following our information. You will find all the distances between the ports in nautical miles and some general information, including weather information in the several areas of Greece. Sail in Greece with our charter yachts and enjoy cruising in the deep blue Greek waters through an endless number of islands each one entirely different from the others, yet all purely Greek in nature. Rent a yacht that suits your needs by choosing between our numerous very well equipped and economy charter yachts and go for the cruise of your dreams.